This specimen has been growing in our nursery for decades. 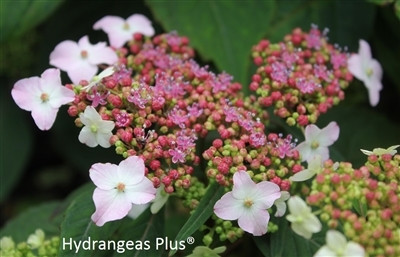 It's a reliable and faithful compact plant that blooms every year in the garden. Did I mention compact? It is staying well under 2 feet with annual pruning. Blooms start off white and quickly turn to pink/blue depending on the pH of the soil then turns red in the late summer. We have it listed as Oamacha as well as Omacha, loosely translating to sweet tea. Enjoy for your smaller gardens.